You should be automatically redirected in 5 seconds. If not, please visit http://www.phemomenon.com and update your bookmarks and RSS feed. I have a confession to make. 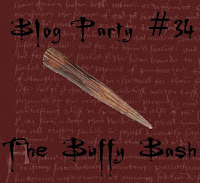 Remember the TV show, Buffy the Vampire Slayer? Well, I came into it late in the game (pretty much the last three seasons) and was completely and totally hooked on this show. Loved it, had to watch it, got very involved with the plotline - and therefore, severely upset when the end of the show came around. Imagine my joy when Stephanie over at Dispensing Happiness (who certainly was dispensing some my way) announced that this month's Blog Party was going to be all about creations inspired by none other than the Buffster herself. Not the movie for heavens sake, but the fabulous TV show. I knew that I couldn't pass this one up. 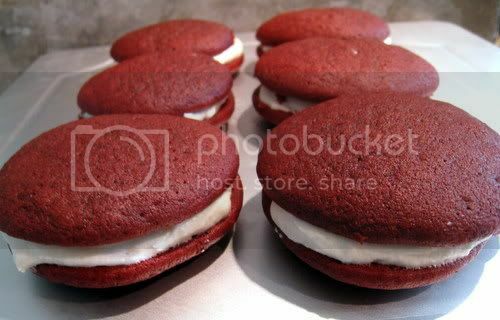 So, for my contribution to this Buffy and Scooby Gang party are these little Red Velvet Whoopie Pies. Obviously, my choice is because what vamp lovin' girl wouldn't like a soft red, can't-quite-put-your-finger-on-it-is-it-chocolate-or-vanilla kind of treat? My very favorite episode of Buffy actually ended up being an episode of its spin-off show, Angel. It's the one where Angel becomes human, "for like 5 minutes." Anyway, it was just long enough for Buffy and Angel (who was, in case you didn't know, a vamp with a soul and the epic love of the Slayer's life) to finally be together - and then they took it away because he had to save the world and help fight the fight to keep her safe. It was completely epic- as in Romeo and Juliet have nothing on Buffy and Angel. Anyway (you were warned I obsessed over the show, right). I wanted to make a very simple, but pretty red drink to go with this but that also had some fizz to it. I decided to spike (haha, get it all you Buffy fans) an orange soda drink with some raspberry syrup and fresh raspberries. The orange soda since it seemed appropriate somehow to Buffy's home in California. Oh, and as an added bonus, this recipe (as noted below) translates easily into Red Velvet Cupcakes with the cream cheese frosting on top and some pecans - it's a two-fer. 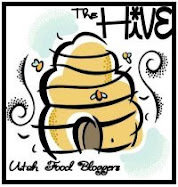 Thanks to Stephanie for coming up with such a fun Blog Party idea! Now, don't forget that today is your last chance to enter to win the Sur la Table gift card I'm giving away. 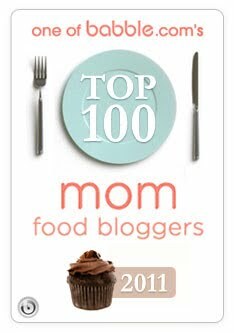 Just check out my Mother's Day post to comment on why you read blogs and enter yourself in the giveaway. Combine the water and sugar in a small saucepan and heat on medium heat until simmering. Simmer until all the sugar has dissolved and the mixture has a syrupy consistency. Add in the raspberry preserves and stir well to combine. Allow to simmer together barely for 1 minute. Remove from heat and transfer to small cup or pitcher to cool and be able to pour into glasses. Once the syrup is cooled, fill glasses with crushed ice and pour about 1 Tablespoon of raspberry syrup into each glass. 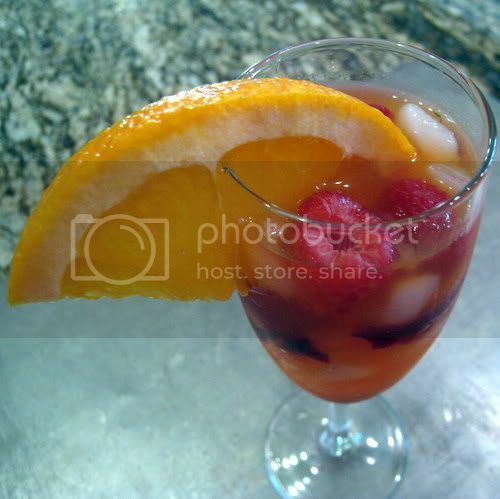 Fill the rest of the glass carefully with soda and top with raspberries and orange slice. Whisk together flour, baking soda, cocoa and salt in a bowl. Stir together buttermilk and vanilla in a cup. Beat together butter and sugar in a large bowl with an electric mixer until pale and fluffy, about 3 minutes, then add egg, beating until combined well. Mix in flour mixture and buttermilk mixture alternately in batches at low speed (scraping down side of bowl occasionally), beginning and ending with flour mixture. Mix until smooth. Spoon about 1 Tablespoon of batter about 1 1/2 inches apart onto a buttered large baking sheet. Bake in middle of oven until tops are puffed and cookies spring back when touched, 10 to 12 minutes. Transfer with a metal spatula to a rack and chill (to cool quickly), about 5 minutes. Make filling/frosting while cookies chill. Once they are completely cool, frost the flat side of a cookie with a generous amount of frosting and sandwich with another cookie. Cream the butter and cream cheese together in an electric mixer. (Be sure that the two are at room temperature, but not melted. Cold cream cheese or butter can make your frosting lumpy.) Add the brown sugar and vanilla extract, and beat for about 2 minutes. Turn off mixer and add 2 cups of powdered sugar. Turn the mixer on a low speed so the sugar doesn’t fly out of the bowl. Slowly add more sugar alternately with the milk until you reach your desired consistency. YUM... it all sounds delicious! i can't wait to try the whoopie pies! Oh Holly, you've gone and done it again! I admire your creativity and the wonderful talent you have in the kitchen! These both look amazing! Very cute pies and cupcakes! I love Buffy and Angel! And I'm so looking forward to making those yummy pies. Thanks for sharing! 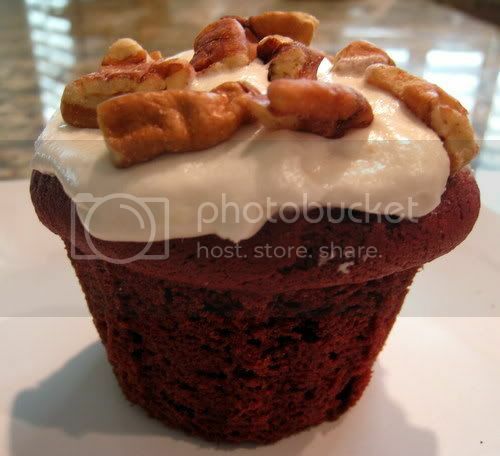 Mmm, I love Red Velvet. These look awesome! i missed the original buffy entirely but got hooked on the show watching reruns. i think my favorite episode was the one with "the gentlemen" when no one can speak or make any sounds. oh, and the musical. joss whedon is a genius. Wow, those look great! And 2 ways to enjoy. i watched buffy religiously in college. seth green as oz was my favorite. i got a little disillusioned later when willow turned into a crazy witch. these whoopie pies get 2 thumbs way up. tasty, plus you get to say "whoopie"! Too funny~ I was just reading about that event yesterday. I couldn't think of a thing. You are so freaking clever. I never got into Buffy but loved Angel. I even subjected my poor Monkey to a whole marathon (the series on DVD) not too long ago- she enjoyed it tho. I love them!!! 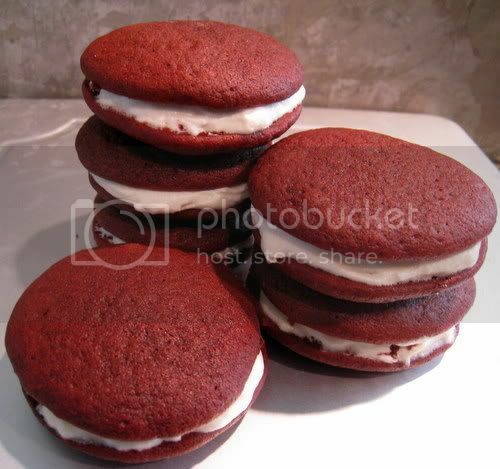 Whoopie Pies plus Red Velvet! So awesome! 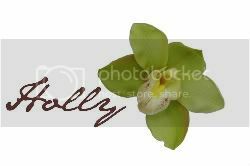 those look so yummy Holly!!!! btw i LUV buffy and angel. I have watched every episode like a thousand times. it's great summertime watching when nothing else is on haha. Made 'em. Yummy. Texture is GREAT for a handheld...FYI: A tablespoon will give you a 'cookie' size pie, whereas an ice cream scoop will give you a 'moonpie' size pie. Either way, the brown sugar cream cheese frosting is a nice, slight twist that is extremely tasty! I'm the Mama to two wild little boys and one very sweet baby girl with Down syndrome. I'm also married to a skydiver/wind tunnel instructor/BASE Jumper. This all makes for an interesting life at our house. So, in an attempt to keep what sanity motherhood and marriage leave me with, I am trying to conquer my world, one recipe at a time. Cheaper than therapy, and much more tasty! Copy this code to add button to your blog or website!